Desiring God Ministries has a free download available of a new devotional by John Piper. 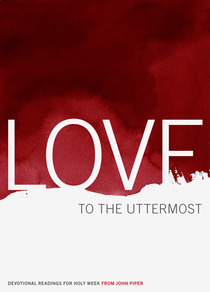 “Love to the Uttermost” provides a devotional reading for each day beginning with Palm Sunday and going through Easter Sunday. I’m looking forward to reading this, and thought you might find it to be a helpful resource as well. Click on the image above to link to Desiring God’s page, where you can download a free PDF, EPUB (for Nook and iBooks), or MOBI (for Kindle) file. Note: As I have not read this resource yet, I should qualify that opinions and doctrine expressed in the materials do not necessarily reflect my own. This entry was posted in Resources, Spiritual and tagged Desiring God, easter, free ebook, Holy Week, John Piper, Love to the Uttermost, Palm Sunday. Bookmark the permalink.